Once in a blue moon I encounter an individual who, upon learning the truth about Amelia Earhart’s fate after spending a lifetime in the dark, becomes extremely interested, to the point where he takes tangible actions that reveal the depth of his enthusiasm for his – or her — newfound interest. I recall my own reaction upon reading my first Earhart book in 1988, the infamous 1970 tome, Amelia Earhart Lives, by the still-living Joe Klaas in collaboration with the late Joe Gervais, and how I was instantly fascinated, hooked beyond hope by Klaas’ web of intrigue, most of it quite fanciful and bogus. After all, this was the book that introduced Irene Bolam, the New Jersey housewife, as Amelia Earhart, and became a sensation for a brief time, until Bolam sued publisher McGraw-Hill for defamation and the book was pulled from the shelves after seven weeks — but it was all new and fascinating beyond words to this uninformed civilian Navy writer. Soon I wrote to Thomas E. Devine, author of Eyewitness: The Amelia Earhart Incident, in West Haven, Conn., after reading his amazing book. Surprised and inspired when I received Devine’s somewhat critical yet encouraging response, I began more than 14 years of correspondence and collaboration with the solitary, embattled Saipan veteran, a collaboration that eventually resulted in With Our Own Eyes: Eyewitnesses to the Final Days of Amelia Earhart (2002). In February 1990, at the conclusion of my first visit to Devine, he signed my copy of Eyewitness, ”Mike Campbell, an enthusiast,” and I suppose that summed it up, at least as the old man saw it. In mid-July of the past summer, a fellow named Bill Xam, 55, of Saline, Mich., placed an ad on www.RadioGuestList.com, seeking guests for his talk show with an unlikely moniker, “Surrounded by Idiots” (www.ussamichigan.com) on the Internet’s Freedom Talk Radio network. Despite the strange program title, I sent him my standard radio query, the one that’s been ignored by many hundreds of radio talk show hosts and program directors, but this was one of my few mailings that actually bore fruit. 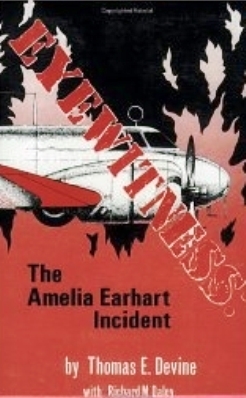 Thomas E. Devine’s classic, Eyewitness: The Amelia Earhart Incident, published by Renaissance House, Frederick, Colo., in 1987. Just a few months later, he now understands how few really do care, and how little the Earhart disappearance means to anyone under 50. Those who can remember sitting by their radios as children, listening for news of the lost “aviatrix,” are leaving us in increasing numbers every day, so barring some unexpected sea change, the future is not promising for a massive revival of interest in the Earhart case, a sad fact reflected in the increasingly dismal sales figures for Amelia Earhart: The Truth at Last. Like the handful of radio hosts who plan to have me on, Xam said he would read my book before we engaged on the air; unlike the vast majority, he actually did read it. After he finished, he wanted to talk about it, and we had a lengthy phone conversation. On Sept. 21, Xam published a nice little YouTube promo for our Sept. 25 show. Next, Bill composed an impressive set of notes for our upcoming interview, and he published these on his site as well. Both the promo and the notes reflected a level of focus, interest and enthusiasm I had never seen in any radio host. For the few who might have an interest in learning the truth about the disappearance of Amelia Earhart and who have stumbled upon this blog, this is your lucky day. Click on the links above, learn and enjoy, courtesy of Bill Xam, a newly commissioned officer in the Earhart Truth Brigade. Finally,someone who wants to hear the truth,lets hope more radio hosts come forward to spread the real facts about A.E.